« Presenting UO Spring Bloggers! Which is Better: A Facebook Group or a Facebook Page? During a class discussion about Facebook yesterday, Sarah Essary and Beth Evans described the Facebook group that they use for UO’s PRSSA. Ali Grise informed us of the Facebook page that FLUX (our UO student magazine) uses. I hopped online today and found discussions by Tim Davies and Peter Leonard (also see Peter’s second post on the topic here). I also compared several Facebook group pages with fan pages. Here’s what I’ve gathered so far. Both groups allow you to have a wall for posts, a discussion forum, pictures, and videos. So what is different? You can send messages to your members’ Facebook inboxes (update: as long as you have 1,200 5,000 members or fewer). The limit used to be 1,200. 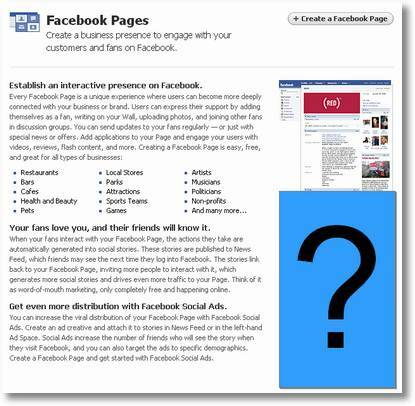 If you already have a Facebook group, creating a Facebook page could create confusion. (update: However, you can transfer your Facebook group to a Facebook page). You can no longer transfer your Facebook group to a Facebook page at this time. Facebook pages let you measure your traffic. Hooray! You need at least 10 fans for the metrics to work. Jump down to “Metrics” on Peter Leonard’s discussion for a picture and details. You are locked into a set of applications on Facebook groups (e.g., wall, photos, video); however, you can create new applications for your Facebook page (such as allowing customers to buy products). There is also an events application for Facebook pages (see here for an example and click on the event). When your fans take action on your page, such as writing on your wall or posting a video, their actions will be documented on the news feeds of their personal pages. Their friends could see the news feeds and check out your organization. Ali pointed out that fan pages stand out on profiles, whereas group pages get lost in the mix. See her page for an example. Look at the left sidebar items and compare her Facebook groups with her Facebook pages. Which option do you think is better? Of course, an organization might want to skip Facebook and set up its own social network through ning, which was a brilliant move for PR Open Mic. Do you know of any other advantages or disadvantages of Facebook pages and groups? I think companies should have both. With the advent of causes and pages, the main reason I join groups is to get messages about events they host. If you’re a “fan” of something, I think it shows a higher level of support. At the same time, many people are hesitant to join groups because they have too many on their profile, so pages would be better for that. This is based entirely on my experience as a Facebook user and someone who has used it for publicity, not research. I’ve heard that Facebook pages are also hard to find. For example, if you’re trying to find a particular company’s page (assuming it has one) and type it into the search bar, you won’t get any results. My roommate was asked to do this for a job once and wasn’t successful in finding well-known, multinational companies that had established Facebook pages. Groups aren’t necessarily easy to search for, but at least give some results. I agree with Beth on this one, but I would put extra emphasis on facebook groups. Facebook pages are ineffective if nobody can find them. Having said that, there are many legitimate ways to publicize facebook pages within facebook itself. Posting pages on profiles, group sites (if an organization opts to go with both) and facebook events is a relatively non intrusive method seems to work well. Also note, as Peter Shankman discovered with his Help-A-Reporter project, that Facebook groups top out at 1,200 members. Personally, I am more of a fan of the facebook groups. I believe you will have a better connection being part of the “group” rather than “friends” with the facebook page. Maybe a larger sense of a relationship? Maybe I’m reading into it too much. Additionally, I am a fan of the feature with facebook groups where you can assign multiple administrators, meaning you can have multiple people maintaining the group and adding any changes or updates. Oh and by the way, my blog is rocking out right now @ http://thepatontheback.wordpress.com! on April 19, 2008 at 8:50 pm Facebook » Which is Better: A Facebook Group or a Facebook Page? Thanks for the comments! For now, I think Facebook Pages are the way to go. Phil mentioned that Facebook Groups top out at 1,200 members. Unless you plan to have a small group over time, this is a serious drawback to Facebook Groups. I tested out the “pages are hard to find” drawback and did not see that pages are more difficult to find than groups. When you type terms into the search bar, the results come up in tabs (people, pages, groups, events). I don’t see how groups are any more visible than pages with this layout. Post a comment back to me if you have an example. I agree with Pat that being part of a group implies a deeper relationship than being a fan of something. So noted! Everyone has really good points about both groups and fan pages! I think that it just really depends on the purpose behind a particular group or fan page. I think for organizations, as Beth pointed out, it would be important to have both. However, i think if it is for more personal use, the Facebook groups are better because they are easier to find and they convey the feeling of belonging. It is good to know that you can actually make the group into a fan page. It is a useful “upgrade” if the creators of the group feel like it is needed! I think it also depends on people’s personal preference and which one they feel more comfortable working with. I’m sure you can have more than 1,200 members in a facebook group. Check out the group for Stephan Colbert that has more than 1,000,000 members. Yes, that’s weird about the group size limits. I wonder if that’s a new anti-spam feature. I’ve noticed Facebook making it increasingly harder to use it for free mass communication since last fall when I could invite all the public relations majors at the U of O to a Facebook event in one night. It was FB’s 1,200 *messaging* limit that vexed our dear Mr. Shankman, not the *membership* limit. My beliefs are that, in general, if you’re are tapping into the world of Facebook for a company or organization, you generally make a group. Yes, it is probably more convenient for the company or org. using it to have an actual page, but I think that the general etiquette is for non-humans to stick to the “group” world an leave the actual FB pages for real humans. You can’t ACTUALLY be friends with PRSA. You CAN be friends with PRSA’s founder. Thanks for the clarification, Phil. Stacey, I think you’re misinterpreting what Facebook pages are. You can be a “fan” of an organization’s Facebook page, not a “friend.” Please see the links in my post for more information or chat with me about it. So how do you do the transfer? What forms do you fill out? and where? Send Facebook the URL to your Facebook group and the URL to the fan page where you want your group content and members to be moved. I have a group with over 8000 people. I have no way to get in touch with my members so having a group is pretty much useless. I’ve sent facebook a link with my group and a new link with a page. I am the owner of the company and we fit in the real estate category. -has anyone successfully transferred a group to a page? -how long does this process take? Thank you for joining this discussion. I do not have the answers to your questions — hopefully someone will. If you go through this process, I hope you will report back with your experience. Good luck! This article has really helped me as I’ve been running a group for about six months – the group is centred around clubnight events that I run and I have nearly 1,500 group members. This is great news… but on the flipside now means that I cannot invite them to this month’s event as I’ve had over 1,200 members now. I’m going to try out the “convert to pages” option that you’ve spoken of – I am very relieved that this option is out there so thanks. I’m glad that my blog post was helpful! Please let me know how the experience of transferring to a fan page goes. Good luck. Well, I submitted a request via the Facebook contact section and within about 5 days or so I’d had a reply from them. Facebook literally updates all your Group members profiles so that they are now fans of your pages. It is worth noting that they still also remain members of the Group. So I now have fans pages with around 1,500 members, plus a group with the same – so I am now in the position of still duplicating content. I’m not sure what the best approach is. One thing I have noticed, and perhaps someone can advise. In a Fan’s page I’ve created an event, but cannot directly invite all the fans to it. All I can do it create an update. Anybody know anything more about this? Thank you for identifying that fans cannot be directly invited to events. Instead, we are limited to sending “updates,” which appear on the updates tab of each fan’s inbox. I made a page a couple weeks ago, had good response, and was using it to post all the events we have. Then recently, I went to post an event and the admin is now me. Before the admin could be the page and the events would show up on the PAGE. What gives? Anyone know what happened? The page was working brilliantly but now it seems only groups can host events. Thank you for commenting on my blog. I admire your university’s debate team! However, at the bottom of the page, you’ll find a place to contact Facebook. I suggest posing your question there. It’s a real shame that you cannot directly invites Fans to an event. I hope this gets resolved as soon as possible. Hard House Blogger, I agree that this is a major problem with Facebook fan pages. We went to all the trouble of converting our Group to a Page thinking it was more official and giving us more options, and now we find that we can’t send proper messages (only “updates” which people routinely don’t see). We are a charity and a campaigning organisation. Messaging our Facebook contacts at crucial times was important and could produce a measurable impact on campaigns and funding appeals. It’s a nightmare that while gaining some analytics functionality and customizability via being a Page, we’ve lost the ability to send proper messages to our fans. Unless we can find a work-around, or unless Facebook fix this sharpish, we’ll have to ask them to reconvert our Page to a Group! Please let me know if you get a response. is there a way to link a group to a page???? We have linked a cause to the fan page, but you could put a group address in there if you want. Do you know about #NAME ? Facebook Group vs Facebook Fan Page: What’s Better? I think pages are the way to go now. Especially if users comment go in their profiles, which I think is new. I have a group page, but I am going to switch back to the page page. I don’t know if this is simply a personal vendetta, or if others feel this way also, but it seems to me that advertising with Facebook pages is uncomfortable. The reason is this; when you add a Facebook page to your network, you are asked to “add friend”. Someone who is concerned mainly with ROI is not really a friend, and because Facebook treats them as such in the context of pages vs. groups, it feels like a slight of hand at best. The line between friend and ROI is becoming more and more blurred in the social media world, which is not always unethical, but when a salesperson unknown to the user is daubed “friend” I think the line is a little too blurred. While I am not slighting the marketing/relationship building value of social media to ROI, I do feel that there is an ethical line to be drawn somewhere in here. All this to say, ethically speaking, I’d say groups are the way to go. It seems if your group falls within the size limit and you want to send messages to your members, then there is value in having a FB Group for your organization. We have several meetings each year and it could be a way to get folks to opt in to reminders about these meetings. It would even be possible to set up a different group for each conference/seminar (we usually have no more than 6/year), but have one fan page for the whole organization. So my thinking is to set up a group page, use it for posting basic information about the organization and its events, use it to send messages and anything else pages are not good for yet, but then link to the fan page which if I remember correctly can even be viewed without signing into FB. The fan page is where I think I would set up custom tabs and have it be more of a FB website for the organization. It would also have a link to sign up for the group if you want to receive messages about events or other announcements. In this way, the group is kind of like a web-based listserv or subscription list you sign up for, and the page is more a mini website. Does that make sense? Your strategy makes sense, although I would do this differently. I would only set up a Facebook group in your case to avoid splitting your audience. People might sign up for both, but there is also a good chance that people might just join either the group or the fan page. Anyone with a Facebook account would be able to access your group page, and I’m guessing that most of your audience has a Facebook account. I don’t think that the added confusion of having two Facebook sites is worth having a page that people can view who do not have an account. With either choice, you can post events. Also note that now with the fan page, you can “send an update to fans.” I understand this to mean that your update shows up on the right side of people’s Facebook site when they log in rather than showing up in their inboxes. Best wishes with your Facebook efforts. I like facebook for social networking and keeping track of my friends but its no bueno when it comes to discovering bands. I find the layout of myspace to be nauseating so I’ve been using http://www.putiton.com to find and follow new music acts. My understanding is that when you post an update on your fan page, it gets posted as a news item to each fan member’s newsfeed — this is the home page for Facebook where you get to see the updates of all friends and organizations you’re following. Follow a few fan pages, and you’ll see in the upper right corner of your home Facebook page (not your profile page but the news feed page) a section you can click on with updates for the fan pages you’re following. I don’t think these updates are easily seen on the newsfeed page. Follow some organizations, and you can see for yourself. Best wishes with your endeavors! My sons band have just created a page rather than a group, which seems to have lots more functionality. However i have noticed that when i create an event – an upcoming gig i can no longer invite members/fans. I do get an option to invite my own friends, however feedback suggests this does not go through. Previously, an event page would show x number of invited guests, how many were coming, how many awaiting reply etc. Now there is nothing there. All this appears to mean we can’t let the bands fans know of gigs and less people therefore attend. Any ideas what i’m doing wrong or if its not me, what i can do to get round this problem…. Best wishes with your efforts! You are right; people can no longer transfer a Facebook group to a Facebook page. I just looked this up. Thank you for the update. I know what you mean, Alex. The flip side to that is that when you’re an administrator of a fan page, you lose your ability to comment as yourself on items in your news feed. I think eventually Facebook will work out this issue. Hang in there. I am not sure if this has been covered since your initial post in 2008, but one thing I find frustrating with Fan Pages that is offered on Groups and not Fan Pages is the Privacy issue. You cannot make (or I have not found a way) to make a Fan Page Private or Closed to member’s connections and not Open to the world of Spam. Am I missing a function with Fan Pages that allows the Fan Page to be members Only? Best wishes with your endeavors. Is it possible to create an Event that is hosted by a Page you have created? Based on some past comments here, it seems that was once available – but looking around on Facebook, it seems I can’t do it now. Any insights? Thanks. Yes, you can host an event through a fan page. When I go to a page I help manage, I see an “events” tab. When I click on the tab, I have the option to “create event.” Good luck with your event! This will allow you to create a vanity URL for your personal page and for your fan page. Of course, the fan page must be associated with your personal account. I am conflicted about Page vs. Group. I’m not a fb member but I jumped in and created a Page (not knowing about Groups) on behalf of people who used to know each other as patrons of a country dancing establishment / saloon and the band that played there in the 1980s and early 90s. Then I contacted a person who contacted another person etc. and a small fan base began to assemble. And almost immediately a bunch of wet-behind-the-ears high school kids who must be having a contest to see how many times they can get their pictures on the web also signed up as fans. To the dismay of the real fans who are old enough to be their grandparents. They haven’t vandalized the Page but they don’t belong there. Had I known about Groups I would have elected that route from the git-go just because Pages are a free-for-all. Nor am I able to find anyone discussing whether a Page can be converted to a Group other than by deleting/recreating. I’m sorry to hear that a group of students crashed your fan page site. I don’t see any perfect solution to this. You might consider setting up a Facebook group. You have the option to keep the group secret, meaning that it doesn’t show up on Facebook, or you can keep the group closed, meaning that people can see that the group exists, but they have to be approved by you, the administrator, to join it. With this plan, you could post a message to the fan page to acknowledge and appreciate the broad interest in the establishment and to announce the addition of a Facebook group that is for the people who were patrons of the country dancing establishment between 19XX and 19XX. You would then invite the patrons to contact you to join the group. Another option, of course, is to continue with the fan page and not be bothered by the students’ interest in the site, particularly since they have merely joined the group. I agree with your friend that you should not remove them from the fan page. I just started a facebook group and am thinking of switching instead to a Page. Ina group page, you can remove and ban a member… can you do this in a Fan Page? Remove a Fan? I think a Facebook group allows members to interact with people who share the same interests such as hobbies, music and even relatives and families. A Facebook group function can help you filter the people who can see your posts and photos. You can connect with other people without the interference of people whom you don’t know.